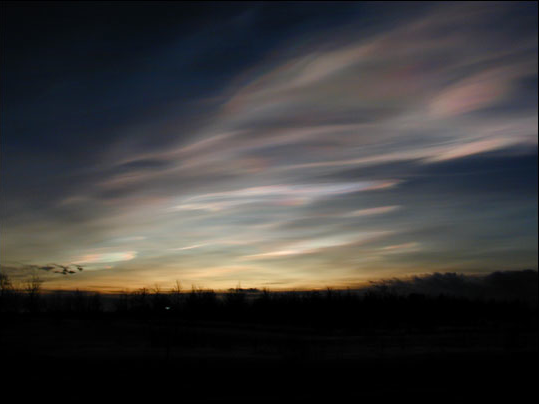 One explanation for the decrease in the equator to pole temperature difference (EPTD) during equable climates examines the influence of polar stratospheric clouds (PSCs) on longwave radiation leaving the Earth in the high-latitudes and, as a result, on temperatures near the poles. 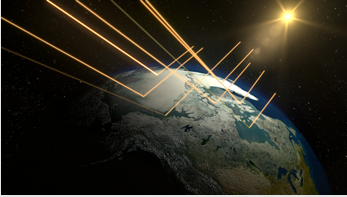 In contrast to theories explaining ways of transporting more heat to the poles, this concept focuses on trapping heat in the high-latitudes. As a starting point, an important fact to note is that the high-latitudes receive the most solar radiation in the world during the summer. This large amount of radiation can raise polar temperatures substantially, so a polar warming mechanism only needs to increase temperatures during the winter to explain equable climates. This fact makes PSCs a plausible explanation for equable climates. PSCs are clouds that form when water vapor enters the stratosphere and when temperatures are cold enough for water vapor to condense there. 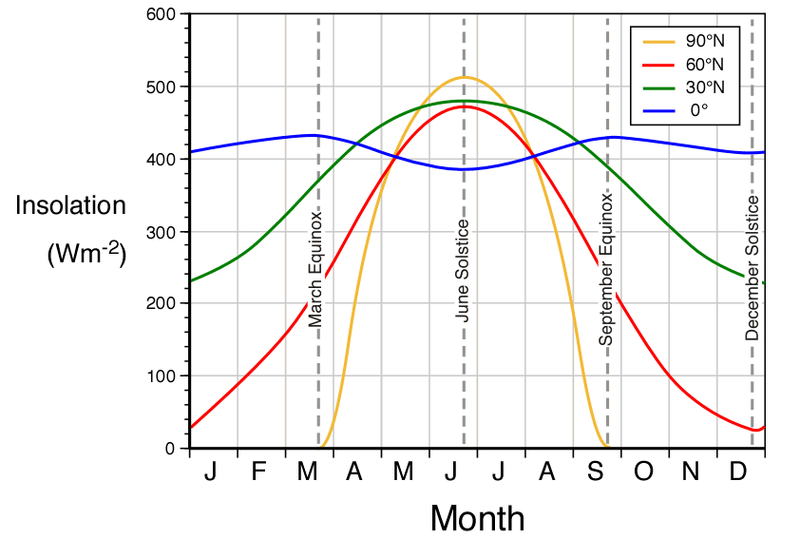 During the winter, the high latitudes receive very little to no solar radiation, so temperatures drop significantly during this period, known as polar night. Under these conditions, PSCs can develop. They trap outgoing longwave radiation (OLR) and emit some of it back towards the Earth's surface, so they hinder atmospheric cooling. PSCs currently are relatively uncommon; however, under different atmospheric conditions that would enable more water vapor to enter the stratosphere, PSCs could develop more frequently. This change would cause warming in the high-latitudes as longwave radiation would not be able to escape the Earth's atmosphere as easily. The idea that PSCs could have caused the equable climates appeared in 1992 when Sloan et al. presented the idea that higher levels of methane in the atmosphere during the Eocene could have caused the frequency and the optical thickness of PSCs to increase substantially. According to the paper, this development would have caused the polar regions to warm and could have created the equable climate during the Eocene and the Cretaceous. The authors based their argument off of the fact that much larger amounts of wetlands, which are methane sources, existed during the Paleocene and the Eocene than presently. They claim that the "area of wetlands possible in the Palaeocene-Eocene would have been at least 5.6x106 km2, compared with 2x106 km2 for the present. Thus, during the Palaeocene-Eocene, there would be the potential to triple modern methane production from wetland ecosystems alone" (Sloan et al., 1992). While these numbers are just estimates, an amount of Paleocene-Eocene wetlands anywhere near this scale could have had a significant impact on the environment by producing large amounts of methane. Methane oxidizes to form water vapor in the atmosphere, so the amount of water vapor entering the stratosphere would have increased if the amount of methane in the atmosphere had been greater. As a result of more stratospheric water vapor, PSCs would have been able to form more frequently and would have been optically thicker. Thicker PSCs trap more longwave radiation, so the development of more, optically thicker PSCs would have warmed the high-latitudes while not influencing the low-latitudes. To test this hypothesis, Sloan and Pollard in 1998 created an experiment to examine the influence of PSCs on the high-latitudes. They performed a model experiment with two different situations. The first scenario had no PSCs, while the second case had PSCs. Otherwise, the runs were the same and had conditions set for an Eocene-like Earth, and they had carbon dioxide levels of 560 ppm and methane levels of 0.700 ppm. Sloan and Pollard prescribed the PSCs so that they only existed during the winter half of the year above 66.5° latitude where temperatures would be cold enough for PSCs to form. The experiment revealed that PSCs could warm the high-latitudes by up to 20°C more than if they were not present and that PSCs prevent sea ice from developing during the winter, so sea ice levels decreased significantly in the PSC case (Sloan and Pollard, 1998). Despite these results, the experiment with PSCs still produced temperatures that were too low in comparison to proxy data from the Paleocene-Eocene. In addition, this study only investigated the influence of PSCs on the climate and did not examine the effects of high greenhouse gas levels and PSCs together. Therefore, Peters and Sloan in 2000 presented another paper that investigated the impact of large amounts of greenhouse gases combined with PSCs. In this study, they performed two model experiments, just as Sloan and Pollard did. Both scenarios had carbon dioxide levels set at 560 ppm, which is 2 times the preindustrial level. The first situation, ECONTROL, had an atmospheric methane concentration of 0.700 ppm, the preindustrial amount, and did not have any PSCs. In the second case, named PCLOUD, methane levels were 10 ppm, which is 14 times the amount of preindustrial levels, and PSCs were prescribed as in the Sloan and Pollard study. The results showed a globally averaged mean annual temperature (MAT) increase of 3.4°C, and MATs in PCLOUD were warmer than ECONTROL by 12°C in the Northern Hemisphere and by 9°C in the Southern Hemisphere. However, in the Tropics, the MATs of PCLOUD was only warmer than that of ECONTROL by 2°C. Additionally, the cold-month mean temperature increased by 25°C in the Northern Hemisphere and by 18°C in the Southern Hemisphere. As a result, the study shows that the combined effects of PSCs and higher levels of greenhouse gases could raise polar temperatures while not affecting the Tropics substantially. Specifically, it reveals the impact of more methane and more PSCs on the climate and demonstrates that these two factors could have caused equable climates. Although the study produced results supporting the idea that higher methane concentrations and more PSCs could have caused equable climates, there are two major problems with this idea. First of all, in the modern atmosphere, methane has a lifetime of roughly 7 years, while the Eocene polar warmth existed for about 10 million years (Kirk-Davidoff, Schrag, and Anderson, 2002). This fact makes it seem unlikely that methane could have persisted long enough to have caused an equable climate. Even if methane's lifetime increased during the Eocene, it is doubtful that methane levels were sustained at concentrations suggested in the Peters and Sloan study throughout the duration of the Eocene. Additionally, Peters and Sloan do not separate the impacts of methane from that of PSCs. It assumes that methane concentrations and the amount of PSCs are directly correlated and does not examine if more PSCs form because of methane. Therefore, one cannot be sure that it accurately portrays atmospheric dynamics. Similar to the scenario in the Sloan and Pollard study, it is possible that only higher carbon dioxide levels are necessary to cause more PSCs and an equable climate. As a result, methane may not be as important to the creation of PSCs and of equable climates as Sloan et al. originally postulated. 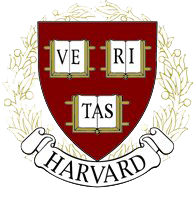 Following this train of thought, David B. Kirk-Davidoff, Daniel P. Schrag, and James G. Anderson decided to investigate the importance of carbon dioxide on PSC formation and argued that only higher carbon dioxide levels are necessary to cause equable climates (2002). In a simplified form, they state that higher greenhouse gas concentrations reduced the amount of ice in the high-latitudes, and this change reduced the EPTD. When the EPTD decreased, energy from waves, propagating into the stratosphere from the troposphere, also decreased, so the stratospheric overturning circulation slowed down. Therefore, the tropical stratosphere warmed while the polar stratosphere cooled because the circulation did not disperse heat as much. As a result, PSCs could form and caused the poles to warm even more. Diving into more depth, the theory starts with the idea that the concentration of carbon dioxide increased during the Eocene. Because carbon dioxide is a greenhouse gas, higher carbon dioxide levels strengthened the atmosphere's ability to trap longwave radiation being emitted by the Earth. Thus, heat could not escape Earth's atmosphere as well, so over time, the Earth warmed. This change caused ice in the high-latitudes to melt, so the albedo in the high-latitudes decreased. The albedo is the reflectivity of a surface, and lighter colored surfaces have higher albedos because they reflect more light than dark surfaces. Thus, when the ice melted in the high-latitudes, the ocean and the continents reflected less light than the ice that was previously covering them did. As a result, the polar regions absorbed more solar radiation and consequently warmed more. The Tropics, however, did not undergo any major albedo changes, so only carbon dioxide levels had an affect on the region. Only having higher carbon dioxide levels would have increased global temperatures equally at all latitudes, but the additional effect of the ice-albedo feedback in the high-latitudes would have increased the temperatures more there. This fact explains why higher greenhouse gas levels could have caused a lower EPTD. The theory then makes the assumption that the decrease in the EPTD caused "the energy of gravity and planetary waves propagating from the troposphere into the stratosphere [to] be reduced" (Kirk-Davidoff, Schrag, and Anderson, 2002). This idea comes from the fact that storms in the mid-latitudes form because of the meridional temperature gradient and that these storms create waves in the troposphere. If the temperature gradient decreased, fewer storms would develop because the atmosphere would be in a more stable state, and as a result, fewer, less intense waves would form. Therefore, a lower EPTD would have caused a reduction in the amount of energy entering the stratosphere. This concept is not farfetched as some studies (Lindzen and Farrell, 1980; Rind, 1998; Shindell et al. 1998; and Fusco and Salby, 1999) support the idea that under a decreased EPTD, atmospheric wave activity and propagation decreases. Assuming a smaller EPTD has this effect, this drop in wave energy would have lessened the momentum transferred to the stratosphere by these waves. This reduction in momentum would have altered the rate of stratospheric overturning because this momentum drives the Brewer-Dobson circulation, the overturning circulation in the stratosphere. The Brewer-Dobson circulation is characterized by warm air rising in the low-latitudes and cold air sinking in the high latitudes. Because the momentum from planetary and gravity waves drives the circulation, if the momentum transferred to the stratosphere had decreased, the circulation would have slowed down. Therefore, the low-latitudes would have become hotter, while the high-latitudes would have cooled. Generally, the top of the troposphere is too cold to allow water vapor to enter the stratosphere. Clouds typically rise in the troposphere due to convection, but at a certain point, the atmosphere becomes too cold for the clouds to rise anymore because all of the water vapor in them precipitates. This point usually occurs by the top of the troposphere, so very little water vapor enters the stratosphere. However, if the overturning circulation slowed and if the low-latitude stratosphere warmed down to the tropopause, the top of the troposphere could have warmed enough to allow the amount of water vapor entering the stratosphere to have increased. This water vapor then would have been transported to the high latitudes, and PSCs would have been able to form more frequently and would have been optically thicker. 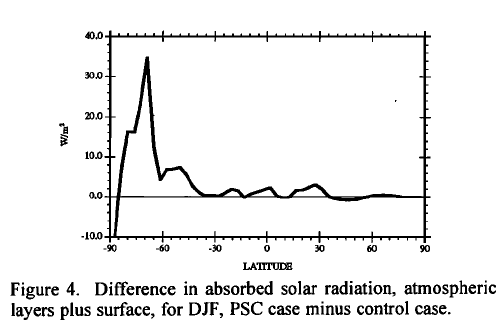 As PSCs developed under these conditions, the window through which longwave radiation could have escaped from the atmosphere would have decreased, and the high-latitude atmosphere would have warmed. According to Kirk-Davidoff, Schrag, and Anderson, the heating due to PSCs in their model's Eocene conditions case is 15 W/m2 in the poles, and warming in the polar regions due to PSCs is 7 K. These results reveal that PSCs could have had a significant impact on high-latitude temperatures. As a result, the theory provides a reasonable explanation for why the poles would have warmed during the equable climates.